Heading date - early, mid or late. Ryegrass varies from the most persistent (perennial ryegrass) to the least persistent (annual ryegrass) and can be broadly categorised by how long they live or persist. These two ryegrass species are described together because they are used in similar situations, for their fast establishment and high winter - early spring DM yield. Annual and Italian ryegrasses both establish very quickly and in good conditions are typically ready for a first light grazing 4-6 weeks after sowing, up to 2 weeks sooner than a perennial ryegrass. When sown in March as a winter crop, annual and Italian ryegrasses produce a similar amount, normally 7-8 t DM/ha over 6-8 months. Annual ryegrass is less persistent and is most commonly autumn sown as a 6-8 month winter/spring crop. In summer moist areas with low insect pressures it can persist for 1-2 years. Italian ryegrasses typically last 12-18 months in drier areas, and 3 or more years under mild summer conditions. Some recent Italian ryegrasses have endophyte so may persist a year longer than those without, depending upon the pests present. Italian ryegrasses keep growing into summer, and over a 12 month period typically produce 15 t DM/ha, However, this figure varies widely with yields of 20 t DM/ha measured in summer wet or irrigated conditions, whereas in very dry summer conditions yields have been as low as 10 t DM/ha). Including Italian or annual ryegrass in a permanent pasture seed mix is not generally recommended. They will die out, allowing weeds to take over. In the northern northland annual ryegrass is a suitable host for black beetle. Short rotation or hybrid ryegrasses are generally derived from crossing perennial ryegrass and Italian ryegrass. Cultivars vary, but typically persist from 2-5 years, depending on conditions. Their feed quality and winter growth is very good, generally a little higher than perennial ryegrass in similar circumstances. Many cultivars contain endophyte which improves their persistence. The total DM yield of short rotation ryegrasses is similar, or higher, than perennial ryegrass over a 12 month period. The major difference however is the cool season production, which is typically higher. Summer feed quality is influenced by aftermath heading (or seeding), and potential summer growth varies between cultivars. As a short term pasture, where a paddock is destined to go into crop in 2-5 years. For undersowing into thin pasture to improve its growth for 2-3 years. Added to perennial pasture seed mixtures to provide increased winter production during the first few years and to boost animal performance in cooler regions. Perennial ryegrass is the most widely sown grass in New Zealand as it grows well in a wide range of conditions; is easy to establish and manage; provides high animal performance; generally has good persistence and forms a compatible mix with white clover. Production of perennial ryegrass-based pastures on dairy farms average 14 t DM/ha/year in New Zealand, with yields over 20 t DM/ha/year achieved under irrigation. In summer moist environments with good management perennial ryegrass pastures can last indefinitely. Where summer dry conditions and significant pest pressure prevail, a more realistic expectation of persistence may be less than 10 years. Pasture management is a key determining factor, so persistence varies widely in these situations. Ploidy refers to the number of chromosones per cell in a plant. A diploid ryegrass has two while a tetraploid ryegrass has four. These differences create differing plant characteristics giving both advantages and disadvantages for each type. Diploid plants have more tillers per plant and, due to the lower water content per cell, have a higher dry matter per kilogram of feed and more energy than tetraploid plants. Both varieties have similar protein levels. Tetraploids are more palatable, are preferred by grazing animals, and have been shown to improve milksolids production by up to 7%. However, tetraploid ryegrasses are less robust and require more careful management under stressful conditions. Because of the extra chromosomes, tetraploids have a bigger cell size and have a higher ratio of cell contents (soluble carbohydrates) to cell wall (fibre), indicating that they have a higher water content per cell. Recommended in systems with high performance management, particularly where looking to increase per cow performance. 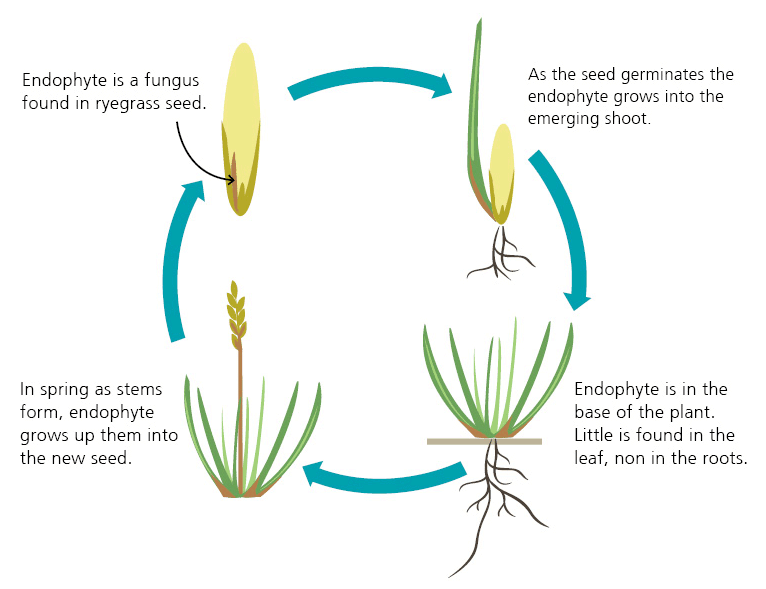 An endophyte is a naturally occurring fungus that is found in ryegrass and tall fescue pastures. They are essential for persistence in most New Zealand pastures. The endophyte protects plants from a range of insects but can be associated with animal health problems, especially ryegrass staggers. There are different types of endophyte and each varies in persistence, yield, and insect protection. A heading date is when 50% of the plants have emerged seedheads. Heading date is an important consideration as seedhead development reduces feed quality in late spring and heading date determines when this occurs. Heading dates are defined relative to the cultivar Nui (approximately 22 October), heading at day 0. Late heading date means better late spring and summer feed quality. Heading dates vary between ryegrasses, and these should be understood to ensure the cultivar mix on a farm is most appropriate to its pasture production requirements and soil characteristics. Late and very late heading cultivars provide a significant advantage in late spring quality, so make pasture management easier, and help maintain the cows pasture intake through this period. It is easier to strategically graze or mow to control seeding of a pasture with a more uniform heading date. Sow no more than 50% of the farm in late or very late cultivars to minimise early spring feed pinches. High sugar grasses are diploid perennial ryegrass bred for elevated levels of water soluble carbohydrates (WSC). There has been considerable research and debate about water soluble carbohydrate, with a review of 21 animal experiments concluded that there was no consistent response of intake, milk yield or liveweight gain to feeding high WSC pastures.